It’s time to make some gnocchi! What’s better than biting into a soft pillow of dough with a flavorful sauce nestled into little ridges on the surface of it? I love to make gnocchi almost as much as I love to eat them. There’s great satisfaction that comes from making food by hand, so my dad and I create an event out of it. I form and cut the dough while he works the gnocchi board with ease. Before we know it, there’s flour all over the kitchen and we are surrounded by trays of gnocchi ready for a pot of boiling water. 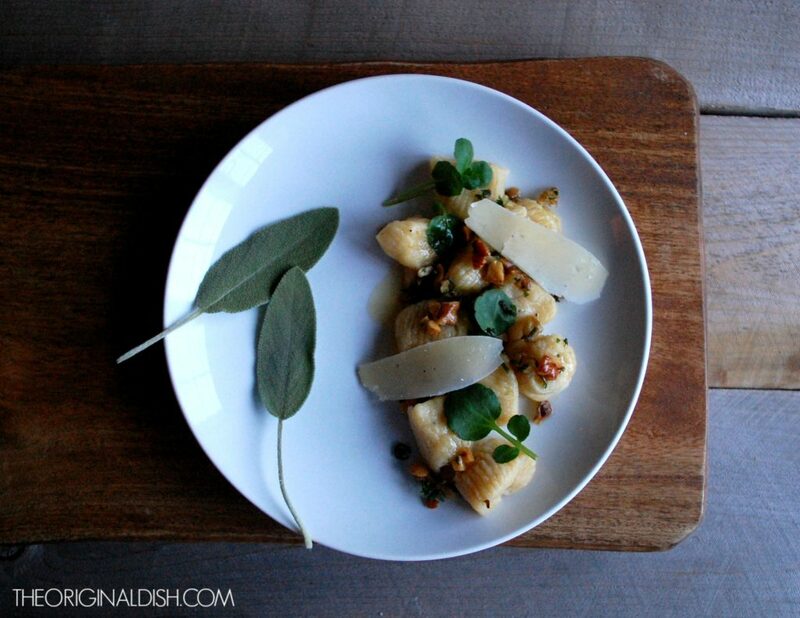 For as easy as it is make and form the gnocchi, the result is exceptional. 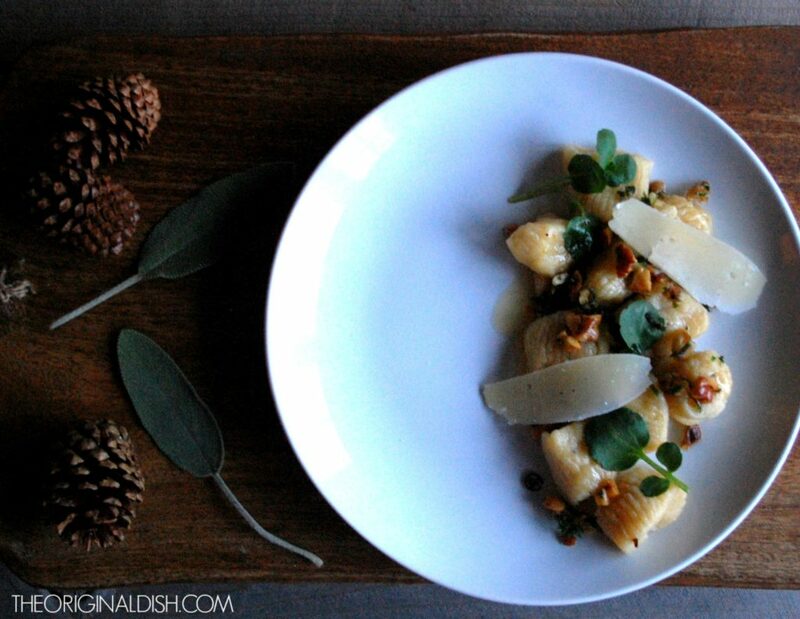 Compared to packages of gnocchi you get from the store, homemade gnocchi is out of this world. They’re light and airy while still having a rich, doughy texture: the best of both worlds. In order to achieve this harmonious balance, it is crucial to keep a very close eye on the gnocchi as it cooks. As soon as the gnocchi float to the top of the water, you want to remove them. This only takes a matter of minutes; you’d be surprised at the difference it makes compared to cooking them any longer. 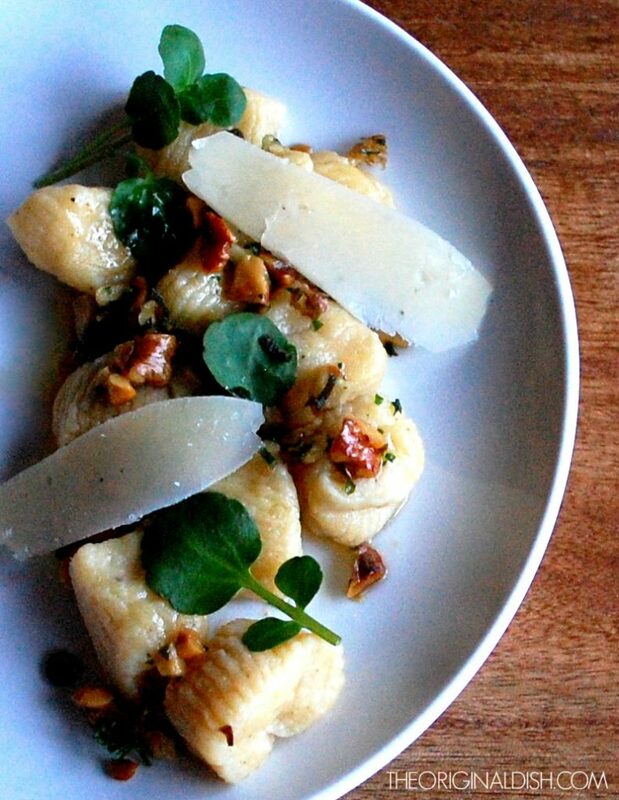 Gnocchi are so delicate that you don’t want anything to overpower them. For a festive touch, I add a hint of pumpkin to the dough, just enough to hit your taste buds at the end of each bite. 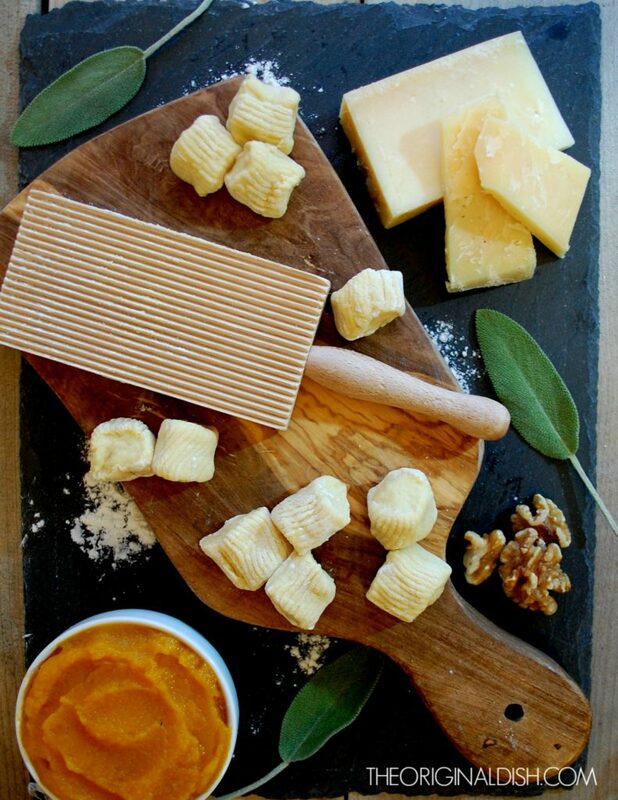 A few other simple components create a dish with the pumpkin gnocchi as the main star. Brown butter and fresh pasta is an instant hit, so I combine nutty brown butter with sweet honey and infuse it with a couple of sage leaves. The result is a sauce that would make anything taste good. The texture is light, but the flavor is rich. 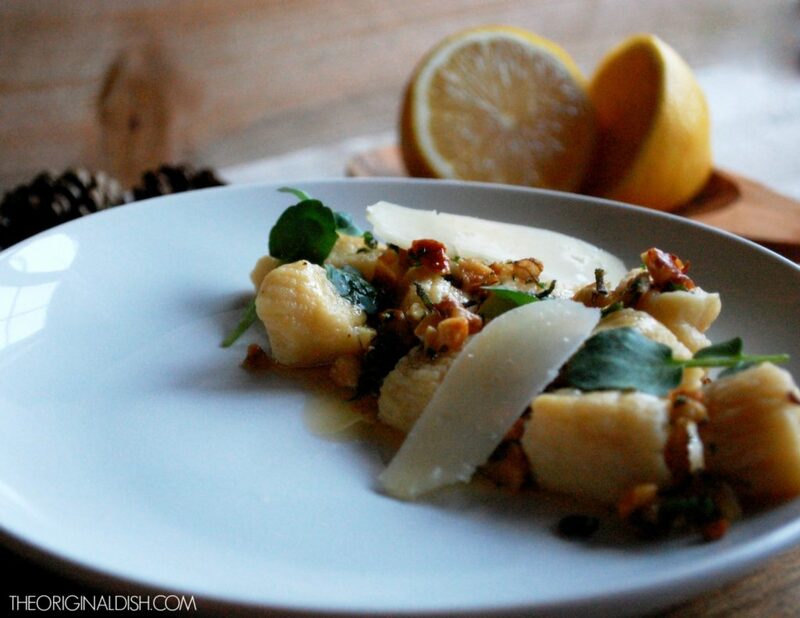 To finish the dish off, I make what I call a fried walnut gremolata. 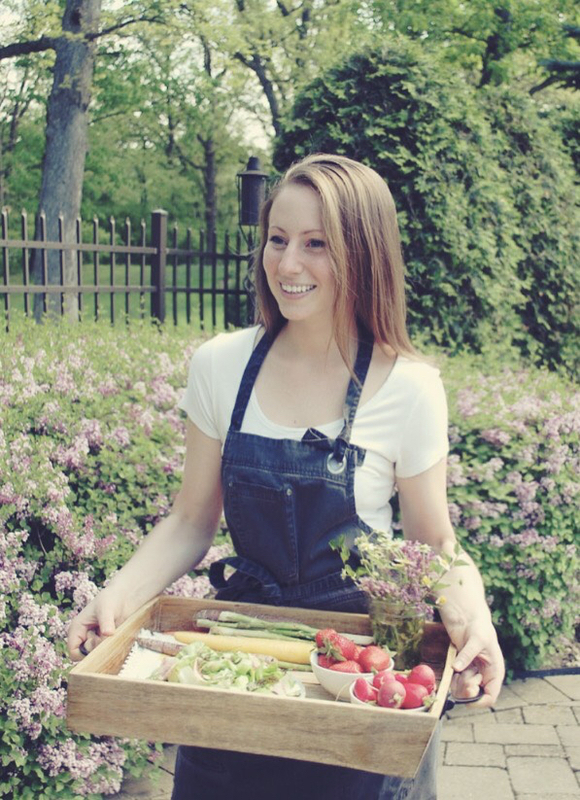 Traditional gremolata is a condiment made of finely chopped parsley, garlic, and lemon zest. My version includes chopped walnuts as the main ingredient and no garlic because its harsh flavor would be too strong. I also replace some of the parsley with chiffonade sage to extend the flavor of the honey brown butter. I quickly fry the gremolata in oil until the walnuts become golden brown and toasty, and the herbs crisp up. A little unsure of how this would turn out, I was pleased to find that it was just the topping that the pumpkin gnocchi needed. And lastly, of course, I couldn’t make gnocchi without having a few shaves of Parmesan cheese over the top. Enjoy! Toss the walnuts, parsley, sage, and lemon zest together in a small bowl. In a medium-sized sauté pan, heat the oil over medium heat. Test the oil to make sure it sizzles. Working in batches, fry the walnut gremolata mixture until golden brown (watch carefully so it doesn’t burn). Using a slotted spoon, transfer the mixture to a paper towel-lined plate and immediately sprinkle with a pinch of salt. Repeat until all of the gremolata is fried. Reserve until ready to serve. Bring a large pot of water to a boil. Peel the potatoes. Cut them in half and then in eighths to get even-sized chunks. Boil the potatoes until tender. Remove from the pot and mash the potatoes with a potato masher until you reach a crumbly consistency. Spread the potatoes out onto a baking sheet and let cool. In a large mixing bowl, combine the cooled potatoes, pumpkin puree, Parmesan cheese, lightly beaten eggs, salt, and pepper. Using your hands, mix until incorporated. Add the flour a half cup at a time until the dough comes together (it will be a little sticky). On a lightly floured working surface, cut the dough into 6 large pieces. Roll each piece out into a long rope, about 1/2-inch in width. Cut the rope into 1/2-inch pieces using a sharp knife. Roll each piece across a gnocchi board, lining them on a floured baking sheet until they are all formed (see Kayla’s notes). In a pot of boiling, salted water, work in batches to cook the gnocchi. As soon as they float to the top, remove them with a slotted spoon. While the gnocchi is cooking, melt the butter in a small saucepan over low heat. When the butter is melted, add the sage leaves and increase the heat so that the butter browns. Watch it closely. As soon as it browns, remove it from the heat and whisk in the honey. 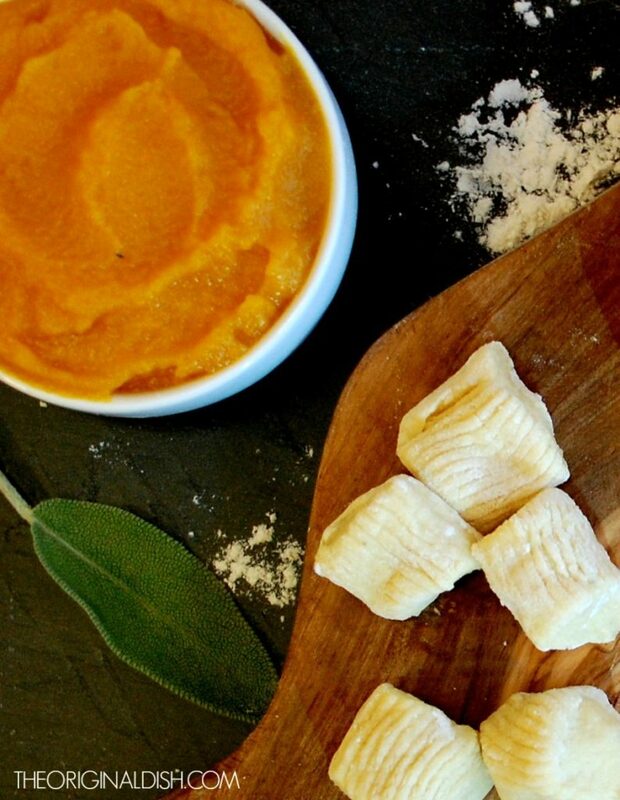 Place the pumpkin gnocchi onto a plate and spoon the honey brown butter over each bite. 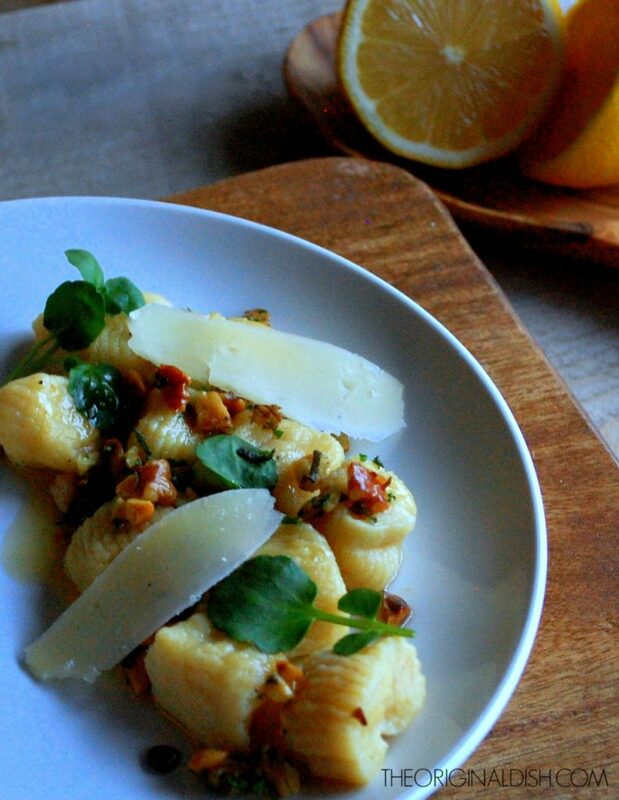 Top with the fried walnut gremolata, shaves of Parmesan cheese, and a few sprigs of watercress. Alternatively, you can lightly toss everything in a large bowl if serving family-style. Season with salt and pepper to taste. 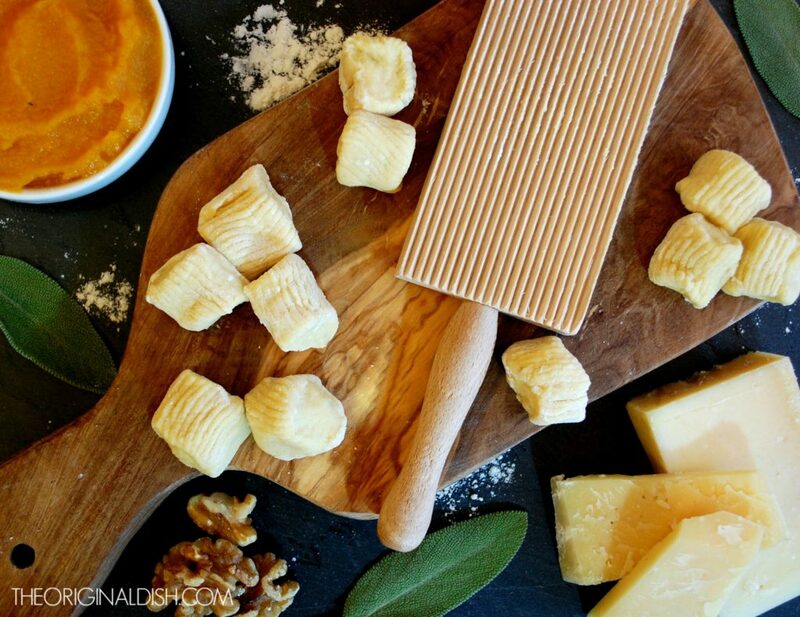 If you do not have a gnocchi board, use the tines of a fork to form the gnocchi. This recipe makes a lot of gnocchi dough. I usually make the dough, cut and form all of the gnocchi, and then freeze whatever I don’t want to immediately cook. You can freeze it in a single layer until nice and firm. Then you can transfer them to a zip-lock bag to save room in your freezer. Just take them out when you want gnocchi again and you can drop them right into boiling water.